Maintain ecosystem balance– Spiders are polyphagous and feed on a variety of available prey. They not only prey on adult insect pests but also feed on their eggs and larvae. They help in maintaining the ecosystem balance. Spiders are good friends of farmers as they control all types of pests on the crop. Water percolation– Some spiders like Geolycosa and tarantulas, make burrow in soil and thus help in water percolation. Spiders protect us from Malaria– Most of the spiders in nature feed on mosquitoes and protect us from Malaria and similar other mosquito borne diseases. Some Pisaurid and Tetragnathid spiders feed on mosquito larvae. Spiders are rich in proteins– The mud wasps, many pollinators, lizards and some birds feed their young ones with spiders as spiders are rich in simple proteins. Spider silk is the best biomaterial which has several applications- The secretions of spiders are boon for human beings. For example silk. Spider silk has high tensile strength, four to five times more than that of iron. Hence, the recombinant silk produced on large scale is used to manufacture cloth from which bulletproof jackets are manufactured. If spider silk rods of 5mm diameter are used in building construction instead of iron rods, earthquake proof houses can be constructed as silk is elastic. This is the nature’s gift which is of great use for the army of any country. Parachute ropes can also be manufactured from spider silk. German scientists have manufactured guitar strings from spider silk. Spider silk is antibiotic– Surgical threads and bandages can be prepared from the spider silk. This silk is biocompatible with human beings. Most of the birds internally line their nests with spider silk because the spider silk is smooth and antibiotic. If young ones are injured with grass-blades or their pointed tips, they do not get bacterial infection as they are in contact with antibacterial silk. Spider silk reflects UV rays– Spider silk covering the egg sacs of spider reflects UV rays and thus protects the tiny delicate eggs. With this property, the spider silk is now a day used to manufacture UV reflecting cloths. Spider venom as a drug– Spider venom is used to manufacture medicines against cancer. Pesticides from spider venom– Now a day pesticides are also manufactured from spider venom. Venom from the world’s most poisonous spiders may help save the world’s honeybees, providing a biopesticide that kills pests but spares the precious pollinators. Bee populations, both wild and captive, are in decline in Europe, the Americas and Asia for reasons scientists are struggling to understand, with industrial pesticides among the suspected culprits. Certain pesticides used to protect crops can scramble the brain circuits of honeybees, affecting memory and navigation skills they need to find food, placing entire hives under threat. Astonishingly, the spider venom is not venomous for humans, only slight allergic responses are seen after envenomation. For many decades, insecticides have been widely used to control pests in all natural habitats and in urban ecosystems. However, the continuous use of a wide range of pesticides has caused many side effects, including loss of biodiversity. The loss of spider diversity is no exception. The situation is worsening due to climate change, global warming and global dimming. Changes in traditional agricultural practices, increasing incidences of forest fires, excessive grazing activities in forests and urbanization have intensified the loss of biodiversity. In such a situation of unstable seasons and depleting sources of water, environmentalists and arachnologists have to think of conserving important species such as spiders as they are the only species that keep ecosystems in balance in all respects. Spiders are potential biocontrol agents because they are relatively resistant to starvation and desiccation. Additionally, spiders become active as soon as conditions are favourable, and they are among the first predators able to limit pests. The risks associated with using spiders to control pests are minimal. They do not harm plants. Since diverse species of spiders are naturally present in all ecosystems and are predaceous at all stages of their development, they occupy many niches, attacking many pest species simultaneously. It has become necessary to find solutions for conserving the depleting populations of spiders in the light of climate change. The most important reason for conserving spiders is the role they play in providing free ecosystem services, such as keeping in control insect pest populations, serving as food for birds and bees, and provision of spider silk and venom. In India, spider populations are decreasing rapidly because of the following threats: (1) climate change, (2) grazing, (3) deforestation/habitat loss, (4) forest fires, (5) scarcity of water, (6) use of pesticides in agriculture, (7) Indian agricultural practices such as burning of litter and waste of crop remains and ploughing during late May, (8) use of mosquito repellents and larvicidal pesticides to control malaria, (9) urbanization, (10) development of road networks (11) trade and many more. Due to climate change, the seasons have become unstable. There can be rains in summer or even in winter. Most spiders require the right humidity for survival, and their life cycles are synchronized with the rainy season and winter. Most spiders lay egg sacs during September/October i.e. by the end of the rainy season. If there are heavy rains during winter or if there is global dimming, there is high mortality. Because of global warming, there is water scarcity, resulting in a less hygroscopic environment, and spiders cannot tolerate high temperatures. Streams become dry, and there is no water in downstream reservoirs. These conditions are unfavorable for the survival of spiders. The structural complexity of the environment is directly related to the spider density and diversity. Grazing by domesticated herbivores in forests leads to destruction of the habitat of spiders that inhabit grasses and shrubs, for example Argiope (Signature Spider). During grazing, some spiders are eaten up, and in many cases the orb web is destroyed and the spiders have to spend more energy for preparing another web. Grazing also results in loosening of soil on the slopes, thus leading to soil removal during the rainy season as runoff. This affects the growth of shrubs (habitat degradation), affecting the spider population. Grazing also results in the spread of Lantana camara (a weed), which prevents the growth of shrubs and grasses, affecting the spider habitat severely. In India, most forest habitats are facing the problem of this weed suppressing the growth of endemic shrubs and grasses. To conserve spiders, grazing by domestic herbivores must be avoided in forest management plans to protect spider habitats. Deforestation destroys many natural habitats, affecting the natural composition of animal and plant communities. When forests are just cut down and natural succession is allowed to take place, a different flora and fauna colonize the area, affecting the spider diversity and population. In addition, the soil is destroyed when the organic litter of the forest floor is washed away. There are a lot of different weeds that grow quickly in clear-cuttings after logging and/or burning, and the vegetation is altered within a short period of time. The weeds create new habitats for many different kinds of arthropods. But spiders require suitable places to make their webs. They take time to adjust to the new conditions, and the population is affected. There is a loss of habitat of Thrigmopoeus truculentus in the Western Ghats. This spider is categorized as ‘Near Threatened’ as it does not meet the ‘restricted distribution criteria’. The habitat of Poecilotheria hanumavilasumica (Rameshwaram Parachute Spider) has been destroyed because of various reasons and due to the limited area of distribution of this spider, its existence is in peril. It is declared as Critically Endangered. Hence, if we learn about such microscopic details of every species, we will be able to save them from extinction. There is a need to seriously look into the taxonomic details, descriptions and assessments of the distribution of the tarantula group. We need to identify new tarantula species, understand their distributions and identify the threats associated with their existence. Only then can we conserve them. Forest fires have a profound effect on all arthropods in a forest ecosystem. Not only does the burning kill a lot of arthropods directly, it also alters the ground vegetation and the organic soil cover, which in turn alters the conditions for ground-living animals. In one experiment, we studied the spider population before and after a forest fire. We also studied the impact of the forest fire on the soil pH and the population of spiders in the following season. In a dry deciduous forest, the plant litter starts decaying after the first rains and forms a suitable habitat for soil arthropods and bacteria, which helps complete the decaying of the litter. Spiders feed on this arthropod population, controlling them. The excreta of the spiders fall on the soil, affecting its pH. Thus in a food web, spiders play a crucial role as predators and are at the top of this temporary ecosystem. Then in the following months, grasses and shrubs develop, providing a good habitat for other spiders. We found less diversity and a smaller population of spiders in Melghat in fire-affected compartments. To conserve spiders, fire can be prevented by carrying out fire line work well before February. Spiders from the families Pisauridae and Tetragnathidae prefer to live along streams and water bodies. If water is not available during their life-cycle stages, from the laying of egg sacs to development up to eight or nine moulting stages, they cannot survive. To conserve these spiders, water must be made available by digging trenches in streams before the rainy season so that water will be available and maintain the correct humidity. During these days of global warming, the population and diversity of pissaurids are affected. From data for the last 5 years from India, it is clearly seen that no new species have been added from these families and that their population is decreasing in Melghat, Maharashtra. Farmers use pesticides to protect their cash crops from pests. They spray pesticides to kill the pests, and simultaneously, non-target invertebrates such as spiders are also killed. Actually, spiders being generalized feeders, can feed on a variety of pests and protect the crops, but farmers use pesticides that kill the spiders too. Several applications of pesticides per season can destroy spider communities. Some pesticides are also retained in the webs of spiders and can be detrimental to those spiders that ingest their webs daily. Pests come back and attack the crop, but spiders do not return so easily to the fields. This creates an imbalance, and the farmers are at a loss. The ecological and biological characteristics of spiders need to be understood. It takes longer for the population densities of spiders to build up after the application of insecticides compared with plant hoppers and leaf hoppers because spiders have a longer generation interval. To conserve spiders, the use of pesticides must be banned and farmers should be trained about this. Even spiders can be used as biocontrol agents. Yes, it is possible if spiders are reared according to the infestation of crops. Fortunately, the life cycle of agriculture cash crops overlaps with the life cycle of spiders, i.e. June to December. Farmers can be trained for rearing spiders that have high fecundity. In India, agricultural practices are changing, and farmers have stopped using organic fertilizers. In one experiment, we saw that banana fields in which organic manure was used had quite a high spider population (780 Thelacantha per acre + 1240 Cyclosa per acre + 2000 lycosids + other spiders) compared with that in an agro field in which inorganic fertilizers were used. The family Lycosidae made up only 5% of the community in conventional fields where inorganic pesticides were used, but they made up 35% in organic fields. Spider densities were also found to be increased in banana and orange fields where straw mulch was used as a ground cover to prevent water evaporation. Burning litter and crop remains kills ground spiders. To conserve ground burrowing spiders in agro-ecosystems, farmers should plough their fields before March so that these spiders are not destroyed because their burrowing activities begin during the first week of April. They grow and mature before the onset of the rainy season. Soil disturbance by ploughing destroys overwintering sites and can kill any spiders already present in the soil. The movement of farm equipment through a crop field damages spider webs and may destroy web attachment sites. Consequently, the spider density and diversity are higher in organic fields than in conventional ones. Spiders have a wide range of prey species, catch significant numbers of their prey and use various foraging strategies. Crop diversity also leads to an availability of alternative prey, which may increase the spider diversity as well as reduce the territory size of spiders, leading to a stable population of spiders at high densities. Conservation of predators like spiders in the field can be accomplished by reducing physical disturbances to the habitat. Thus, to conserve and enhance spider populations, agricultural systems should be manipulated in ways beneficial to the needs of spiders. For mosquito control, Indians use mosquito repellents in their houses. This has badly affected the population of house spiders such as Pholcus, Salticids and Gnaphosids. Spiders in houses are helpful in mosquito control. A room of size 10 feet × 10 feet must have five or six pholcids if all the mosquitoes are to be fed on. Similarly, the larval stages of mosquitoes that inhabit water bodies can also be controlled by spiders such as tetragnathids, pisaurids and lycosids, living along ditches, streams and rivers. However, we spray pesticides or phenyls to kill the larval stages. Spiders can feed on adult mosquitoes as well as on the larval stages of all types of mosquitoes. Hence, spiders can be conserved by discontinuing the use of mosquito repellents and pesticide sprays. Urbanization is nothing but habitat fragmentation, destruction and/or habitat conversion. Mostly agriculture land or forest land is used for urbanization. This leads to low diversities and higher abundances of restricted species. Particularly, spiders from the families Pisauridae, Tetragnathidae and Clubionidae lose their habitats. Spiders from the families Salticidae, Uloboridae, Therediidae, Pholcidae, Oonopidae and Araneidae dominate urban habitats. To conserve spiders from the families Pisauridae, Tetragnathidae and Clubionidae, which have lost their habitats, development of kitchen gardens, establishment of parks in colonies with moving water in gutters and plantation of trees can be practiced. The FSI of constructions should be increased, with buildings growing vertically rather than horizontally. India being a developing country, development of the road network in India is unavoidable at present. Tree felling is carried out to widen existing roads. This destroys the habitats of spiders that inhabit tree trunks, e.g. spiders from the family Hersiliidae, a few spider salticid genera such as Marengo and Myrmarachnae and social spiders from the family Eresidae. The list is very long. Even in forests, after the rainy season, utility roads are repaired by cutting grasses growing on old roads. This practice should be prolonged till the end of December so that the spiders using grass habitats develop completely and are dispersed widely. Otherwise, after a prolonged period of wrong practices, these species will become endangered. At present most of the spiders are classified as Data Deficient, and research is needed. For conservation of these spiders, it is suggested here that, before felling of trees for developing the road network, trees be planted first at the necessary distance. Once these grow, the old trees can be cut for new roads. Species such as tarantulas are collected and killed on a large scale. Some of the species such as black widows are collected for venom in India and hence their population is decreasing. Tarantulas, the creepy and crawly spiders, are in great demand the world over. And there is apprehension in the Western Ghats, where the species is dwindling because of a sudden aggressiveness in the illegal trade in these arachnids. The poaching of spiders goes unnoticed, and there is no movement as such against the trade. The International Union for Conservation of Nature has listed Poecilotheria regalis, Poecilotheria striata, Poecilotheria hanumavilasumica, Poecilotheria miranda and Poecilotheria metallica, a in the Red Data book as threatened with extinction. Thrigmopoeus truculentus is categorized as ‘Near Threatened’ because it does not meet the restricted distribution criteria. Of the 90 tarantula species found in India, there is a huge demand for 62 for ornamental purposes. These Mygalomorphs should be brought into the scheduled group under the Wildlife Protection Act so that they can be conserved. Various tarantulas and Geolycosa (Lycosidae) spiders make burrows in the soil during the summer for breeding purpose and when the young ones are dispersed these burrows are vacated by adults and thereafter in rainy season, water gets percolated through these burrows. According to one estimate, there are more than 300 holes made by Geolycosa per acre. This definitely helps the percolation of water in the soil, increasing the water-holding capacity of the soil. After the rainy season, shrubs and grasses grown on the pH-corrected (by spiders) soil on which most of the herbivores (primary consumers) depend. The primary consumers (carnivores), the secondary consumers (carnivores) and ultimately the umbrella species, the Tiger also depend on the pH-corrected soil. Thus, if there were no spiders at the bottom subset of the ecosystem, Tigers would not get enough food to survive. Here, it is important to say that the ecosystem in which spiders live is a subset of the ecosystem in which Tigers live. So if spiders are conserved, Tigers are automatically conserved. CAN WE REALLY CONSERVE SPIDERS? As many as 43678 spider species are known in the world (Platnick, 2012), and in India, 1685 spider species from 438 genera have been reported till date (Keswani et al., 2012). The problem is, very little work has been carried out on the behavior and life cycles of all these species. Specific habitats have also not been reported for many species. Rearing techniques are under trial. Climate change has stressed the fauna and flora, and unless the atmospheric CO2 concentration is kept below 350 ppm, the problem cannot be solved. If we see past natural history, 251 million years ago (Permian-Triassic period) a mass extinction occurred on earth due to the carbon dioxide level becoming as high as 2000 ppm, which eliminated 90% of the ocean dwellers and 70% of land plants and animals. Because of global warming 120 million years ago, during which carbon dioxide levels reached 550–590 ppm, another mass extinction involving 80–90% of the marine species and 85% of the land species, including the dinosaurs, was evidenced before 65.5 million years ago. 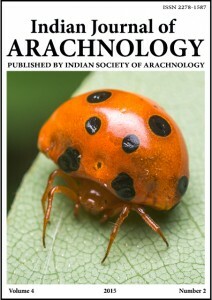 However, in this gloomy scenario in India, there is still hope that spiders can be conserved by making students, researchers and people aware about this most urgent issue, which can be solved not only by keeping the atmospheric CO2 concentration below 350 ppm but also by maintaining the ecosystems of spiders lively and healthy. In my opinion, the primary cause of the decline of spider diversity is not direct human over-exploitation but habitat destruction. Arachnologists should study the life history strategies and sensitivity of spiders to changing habitats. At present, most of the spider species in India are classified as data deficient. The forest, irrigation and agriculture departments should work collectively to solve the problem of conservation of spiders by preventing fire, providing enough water for healthy ecosystems and following eco-friendly agrcultural and forest practices. Farmers, in particular, must stop using fertilizers and pesticides and go for organic farming, using integrated pest management.